Moving VMware implementations to the cloud – what are the options for cloud migration? Moving to the cloud is the perfect time to re-evaluate your organisation's IT strategy. At this year’s VMworld event, VMware announced that it is now possible for customers to run their virtualised infrastructure on Amazon Web Services. Following the growth of public cloud as a deployment option over the past few years, teams with large VMware implementations have looked at how to move their internal clouds to public environments in order to reduce costs. However, there are a lot of options available for enterprise IT teams to consider, from simpler moves to the cloud through to full-scale infrastructure change. Alongside the new option of VMware Cloud on AWS, companies have many choices to consider, including migration to the native AWS platform, to Microsoft Azure or running in a hybrid environment based on specific needs. So what is the right approach for you, and what are the implications of any decision? What reasons exist for VMware cloud migration? We started by asking members of the VMware community what their thoughts would be on migration to the cloud. Based on working with more than 440 community members, we found that there was a strong commitment to cloud – around 90 per cent stated that their organisations would have production instances of VMware running in the cloud by the end of 2018. A big driver for this shift is cost. According to Gartner analyst Kasey Panetta, the analyst firm “estimates through 2017, more than 80 per cent of CIOs will be pressured by business management to evaluate migrating their data centers to cloud IaaS [Infrastructure as a Service].” For many companies, running on public cloud infrastructure or in a hybrid fashion represents a great opportunity to deliver this cost saving, compared to deploying on internal data centres alone. However, this is not the only reason for a shift to cloud; indeed, 38 per cent of respondents mentioned that moving their VMware installs to the cloud was not related to cost at all. Instead, new IT initiatives were listed as the most common reason for the migration by just over 22 per cent of those surveyed. Ease of management was the second most popular reason for the move, and cost came in third. Interestingly, 13.5 per cent of those surveyed considered cloud as more secure than their internal IT infrastructure, and this was the primary reason for the migration taking place. The old objection of cloud security has been well and truly laid to rest. Looking at the research and the feedback from the community, there is a wide mix of drivers for migration. However, the majority are committed to making this shift in the near to medium term. As part of the shift to cloud, companies will have to rethink their approaches to data management. IT infrastructure has become more varied within organisations, with applications split across traditional hardware, internal virtualisation deployments and some cloud applications. What this adds up to is a headache around data protection management. As more workloads move to the cloud, so more data management and protection plans will have to be updated to reflect this. Already, systems administrators are taking on responsibility for data held outside the corporate data centre, with around 73 per cent of respondents also managing cloud application data alongside files and information held on servers. This trend towards cloud will only increase this further. Working in this hybrid world puts pressure on the management side. In response to this, teams are looking at how they can consolidate their tools to make this easier over time. Rather than looking at backup and disaster recovery for each platform, the majority of new deployments will look at how to consolidate protection for all platforms in one place. By handling data management across cloud-based applications and internal VMware installations alongside VMware-on-cloud deployments, the burden on systems administrators should be lessened. Alongside this, planning data protection and disaster recovery more efficiently is a key enabler for cloud. Around 81 per cent of VMware community members surveyed believe that DR for VMs is a core need. 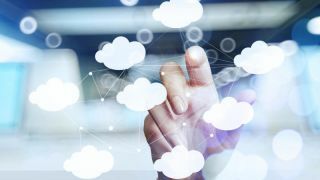 More than half of the respondents (54 per cent) reported they wanted a single, central solution that would protect their data in either a multi-cloud or hybrid cloud environment. Regarding hybrid cloud, 42 per cent of organisations will have virtual infrastructure both on-premises and in the cloud. This also points to a preference for third party applications to manage that data – according to our research, around 73 per cent of the VMware community plan to use a third party Software as a Service platform for data protection and recovery. The reason behind this is that it is easier to get a single view of data across cloud infrastructure, virtualisation, endpoints and cloud applications with a tool that is independent of the platforms or operating systems. While VMware now officially supports customers running on AWS, there are other options for deployment. Previously, VMware ran its own cloud service called vCloud Air, but this has been sold to European cloud provider OVH. Based on our research, the number one preference for the majority of VMware-on-cloud deployments will be AWS. Almost half (48 per cent) of respondents listed AWS as their first choice, with Microsoft’s Azure coming in second. The vCloud Air platform was ranked third, while IBM Softlayer and Google Cloud Platform came in fourth and fifth respectively. The range of cloud platforms available for companies to use as hosts for their virtual machines is high, with localised versions of vCloud Air offering support for companies that don’t feel comfortable having their workloads with companies based in another legal jurisdiction. However, the larger public cloud vendors provide multiple regional cloud locations and availability zones that can provide similar levels of control when it comes to where workloads are physically sited. The VMware community remains highly engaged and committed to virtualisation. However, the move to the cloud has meant that 63 per cent of respondents are now looking at alternative hypervisor platforms as part of their migrations. This figure demonstrates that there may be a growing desire to natively build applications in the cloud instead of replicating VMware environments on public cloud platforms. Businesses are going to move their applications and data to the cloud for regulatory compliance, to optimise workloads, and to avoid lock-in with a particular technology or cloud stack. However, the net result is that the complexity in managing these platforms increases. For companies running a hybrid strategy, this can include deployments of existing on-premises VMware and new VMware on AWS implementations alongside native VMs (otherwise termed Amazon Machine Images) on the EC2/AWS stack. For companies running across multiple clouds, AWS images may sit alongside VMs on Azure compute. Each of these instances will be creating and manipulating data that needs to be backed up. In this hybrid environment, management becomes difficult. Getting true cloud orchestration in place - where rules are automated and the efficiencies of cloud are delivered - becomes a nightmare, as enforcing consistent policy is difficult, and achieving any type of global understanding of your data for compliance purposes is even more challenging. To avoid this, getting a single overview point across each platform will help, as it should bring all the required insight into one place. This should also provide more clarity on how the enterprise is following all the regulations that exist and potentially affect the organisation. For example, the European Union’s General Data Protection Regulation includes control over customer data records crossing over borders, particularly when it comes to data moving outside EU countries. International businesses with operations in more than one country may have different privacy rules to follow around customer data too. As part of any data management platform, being able to apply consistent rules on how and where data is used should be essential for the future. Regardless of whether IT teams use the move to cloud as a reason to re-evaluate IT strategy, or to shift over to lower cost infrastructure, the popularity of cloud will lead to changes in the majority of IT implementations. The rise of AWS and the collaboration with VMware offers an easy potential route for migration, but it is not the only option. The importance of data management and disaster recovery to cloud deployments means that third party data protection tools will have a critical role to play in the future.